Member of the British Empire: Virginia Hall’s “Gold Watch”? Virginia probably had mixed feelings about being named, “Member of the British Empire,” (MBE) in July 1943, just after escaping from France and being liberated from Spanish prison. She richly deserved the honor, one of the UK’s highest, for her espionage and selfless acts of courage that saved countless lives. But for a seasoned spy used to living in the shadows, the public spotlight of the MBE could blow her cover and spell the end of her career as an undercover agent in France–or anywhere else in Europe.
. . . The MBE: Capstone of Virginia’s Career? 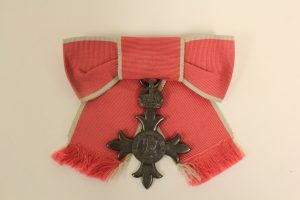 Virginia probably was suspicious that the MBE was the British equivalent of a “gold watch”–the capstone of her career, her spy boss’ pat on the head for a job well done–and she wasn’t through with France. She had left her agents behind, an act which spawns tremendous guilt in any spy that handles clandestine agents, and she desperately wanted to be part of the final chapter in the liberation of France. A Letter Confirming Virginia’s Suspicions . . .
. . . and She Fights to Return to France. “My neck is my own… and I’m willing to get a crick in it because there’s a war (going on)…” Buckmaster’s letter did not provide the last word on Virginia’s future. Virginia Hall did return to France. There’s no record that Virginia took the MBE medal, citation, or met with the King (which typically accompanied the honor) while the war was raging on the continent. Virginia was not motivated by honors or awards and though by war’s end she received many accolades, she always demanded private ceremonies, with only one or two others in attendance. It seems Virginia always preferred the shadows to the spotlight.